1984 In the case of Sony Corp. of America v. Universal City Studios, Inc, the U.S. Supreme Court ruled that home videotaping or recording (for home use) did not violate copyright laws. It upheld the rights of VCR owners to tape programs off TV. Originally in 1976, Sony was charged with copyright infringement by Universal Studios and the Walt Disney Company, seeking to halt the manufacture of Sony's Betamax magnetic videotape recording system. The Adventures of Andre and Wally B (1984) was the first fully-computer-generated animated 3-D short film, worked on by future key Pixar player John Lasseter. It was produced by the Graphics Group, a subsidiary of LucasFilm, that was later split off and renamed Pixar. 1984 Splash (1984), a romantic comedy with Tom Hanks and Daryl Hannah, was Disney's first film released under its new film label "Touchstone Pictures (or Films) " - its first entry into more mature themes (and content) in films. 1984 The fish-out-of-water action comedy Beverly Hills Cop (1984) was the biggest box-office (domestic) hit of the year with box-office gross receipts of $234.7 million (domestic), barely edging out Ghostbusters (1984) at $229 million (domestic). Unknown Brooklyn comic, initially on TV's Saturday Night Live, found his greatest stardom with this series (ultimately with two sequels), after appearing in two earlier movies: 48 HRS. (1982) and then Trading Places (1983), although neither of them broke the $100 million level. Murphy became one of the first black movie stars to be widely accepted by white America, with his character of displaced, rule-breaking Detroit cop Axel Foley, investigating a murder in Beverly Hills. The soundtrack (Harold Faltermeyer's synthesizer) won a Grammy Award for Best Album of Original Score Written for a Motion Picture. The very recognizable "Axel F" theme song played throughout the film. 1984 Star Trek III: The Search for Spock (1984), the third film of the original series, marked the feature-film directing debut of Leonard Nimoy (the movie's character Spock). The success of the film led to Nimoy also directing the next film in the franchise, Star Trek IV: The Voyage Home (1986) - the highest grossing film of the original series at $109.7 million (domestic). 1984 The writing/directing team of Joel and Ethan Coen released their debut film, a modern-day film noir titled Blood Simple (1984). 1984 The PG-13 film rating was introduced, in response to parental protest about the sexualized torture scene (a beating heart was ripped from a victim's chest) in influential producer/director Steven Spielberg's PG-rated Indiana Jones and the Temple of Doom (1984) (his follow-up film to Raiders of the Lost Ark (1981)), and also for violence in Gremlins (1984). The PG category was split into two by the Motion Picture Association of America: PG and PG-13 (for a film having a higher level of intensity). Children under the age of 17 could be admitted, but with parental guidance strongly suggested. Criticisms of this second Indiana Jones film in the franchise were numerous: a weak lead actress (Spielberg's future wife Kate Capshaw), its dark mood, charges of racism, insensitivity and misrepresentation of Indian culture and the Hindu religion, the inaccurate depiction of the Goddess Kali, and the eating of Indian cuisine delicacies including snakes, eyeballs, beetles and chilled monkey brains. 1984 Joe Dante's commercially-successful Gremlins (1984) was one of two films (along with Indiana Jones and the Temple of Doom (1984))directly responsible for the creation of the PG-13 rating by the MPAA. A more comedic sequel followed, Gremlins 2: The New Batch (1990). 1984 The first movie to be released in the US with a PG-13 rating was John Milius' Red Dawn (1984). 1984 The Apple Macintosh computer went on sale to the public on January 24, 1984, introduced by Apple chairman Steve Jobs. It was the first commercially-successful personal computer - with a mouse and graphical-user interface for ease of use, to compete with IBM's and Microsoft DOS computer systems. The computer was introduced by Ridley Scott's TV commercial "1984," costing $1.5 million, which first aired during the third quarter of the year's Super Bowl game - on January 22, 1984. The ad referenced George Orwell's novel Nineteen Eighty-Four and the "Big Brother" conformist society, to be saved by the coming of the Macintosh 128K. 1984 Tri-Star Pictures, formed in 1982 as a joint venture by CBS Television, HBO (Home Box Office) and Columbia Pictures, released its first film in May, The Natural (1984). 1984 The Kenny Loggins' title hit on the soundtrack for the romantic drama Footloose (1984) made it one of the most recognizable dance films of all time. Its story was loosely based on events that took place in the small, rural, and extremely religious farming town of Elmore City, Oklahoma in 1978, when the town's elders banned dancing and rock music. A remake starred Kenny Wormald and Julianne Hough, Footloose (2011). 1984 Sophisticated leading man/actor William Powell died at the age of 91. He had starred in many noteworthy films during his long career, including The Thin Man series (six films from 1934 to 1947, all opposite Myrna Loy as the crime fighting duo of Nick and Nora Charles). He was nominated for the Best Actor Academy Award three times: The Thin Man (1934), My Man Godfrey (1936), and Life With Father (1947), but never won. Other starring film roles included Reckless (1935), Best Picture-winning The Great Ziegfeld (1936), Libeled Lady (1936), Ziegfeld Follies (1946), and Mister Roberts (1955). 1984 The two Conan films (Conan the Barbarian (1982) and Conan the Destroyer (1984)) had brought some notoriety and fame to body-builder-turned-actor Arnold Schwarzenegger, but his career didn't take off until his archetypal role as an indestructible cyborg assassin, The Terminator in James Cameron's The Terminator (1984). 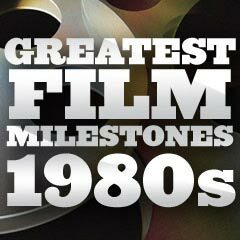 The film took the 21st spot of highest-grossing (domestic) films of 1984, at $38.4 million. 1984 A Nightmare on Elm Street (1984), a notorious slasher film from director Wes Craven, came out late in the year 1984, after both other competing franchises Halloween and Friday the 13th had been launched. This one featured a "dream world," sexually-deviant, sadistic, hideously-grotesque child killer (one of the most popular horror movie icons of all time) - very different from the hulking, mask-wearing Jason Voorhees, and the lunatic homicidal escapee Michael Myers. Freddy Krueger (Robert Englund), a vengeance-crazed dream demon terrorizing teens in the town of Springwood was noted for his blood red/green sweater, horribly disfigured/scarred face, wicked sense of humor, brown fedora hat, and right-hand razor-fingered glove. Craven's film was rejected by all the major studios - and ultimately became one of the earliest films of neophyte New Line Cinema, which went on to major studio status later in the decade. New Line became known as "The House That Freddy Built." There would be many more sequels (seven) and a remake, stretching from 1985 to 2010. 1984 Wolfgang Petersen's The NeverEnding Story (1984), an expensive film shot mostly in Germany, was a fanciful family adventure which did fair box-office (domestic) business, at $20.2 million. It told about a boy named Bastian Bux (Barret Oliver) who ventured to a fantasy world called Fantasia, its Childlike Empress (Tami Stronach), and a young hero named Atreyu (Noah Hathaway) (later the name of a rock band). There were two sequels: The Neverending Story II: The Next Chapter (1990), and The Neverending Story III (1994). There was also a spin-off TV series in 1995. 1984 Director David Lynch's big-budget adaptation of Frank Herbert's 1965 science-fiction work Dune (1984), with a production budget of $40 million, was both a critical and box-office disaster. Its total domestic gross was $30.9 million, and all plans for sequels were cancelled as a result. 1984 The first Hi-Fi VCR (a videocassette recorder with high-fidelity stereo sound) was introduced, first in mid-1983 for Betamax machines, and about a year later for VHS machines in the summer of 1984. 1984 The Voyager Company debuted its Criterion Collection line of special-edition video laserdiscs, with additional revolutionary features such as language options, original aspect ratio widescreen and letterboxed formats (rather than pan-and-scan), supplementary materials, commentaries by directors on audio tracks, interviews, making-of documentaries, photo galleries (stills, posters, artwork, storyboards, shooting scripts), state-of-the-art mastering, and other extras. Their contributions solidified the laserdisc as the choice of cinephiles for over 15 years. These features later became commonplace on releases of DVDs. Rocky's director John G. Avildsen also helmed The Karate Kid (1984), with another 'underdog-triumphs' theme - a very influential dramatic martial arts film. It has been ranked as one of the best high school films of all time. It starred 22 year-old Ralph Macchio as the title character, high school senior Daniel LaRusso. To combat bullies, Daniel sought the tutelage of Kesuke Miyagi (Noriyuki "Pat" Morita) for lessons on life and the skills of karate ("Wax on, wax off" was one of his most famous, oft-repeated quotes). It resulted in three sequels: The Karate Kid, Part II (1986) and The Karate Kid, Part III (1989) both with Ralph Macchio, and a third The Next Karate Kid (1994) with Hilary Swank as new karate student Julie Pierce. There was also the remake The Karate Kid (2010) starring Jackie Chan and Jaden Smith, and an animated TV series in 1989. 1984 The soundtrack of cinematographer Jordan Cronenweth's and director Jonathan Demme's Stop Making Sense (1984), featuring the rock band Talking Heads, was recorded on a 24-track Sony digital recorder. It was notable for being the first all-digital film sound in history. Its documentation of the singing group during three nights in December, 1983 at Hollywood's Pantages Theater has often been considered to be the best rock concert film of all-time. 1984 The comedy Police Academy (1984) was the 6th highest-grossing (domestic) film of 1984, with $81.2 million. There were six inferior sequels within ten years from 1985 to 1994, including Police Academy 2: Their First Assignment (1985), Police Academy 3: Back in Training (1986), Police Academy 4: Citizens on Patrol (1987), Police Academy 5: Assignment Miami Beach (1988), Police Academy 6: City Under Siege (1989), and Police Academy: Mission to Moscow (1994). There was also a short-lived TV series in 1997. 1984 Director John Hughes, the future master of comedic, "teen"-oriented coming-of-age or 'rites of passage' films directed toward a youth audience, released his debut film Sixteen Candles (1984), starring promising red-headed star Molly Ringwald, one of the Brat Packers of the time. The quintessential teenager in John Hughes' youth comedies of the eighties was influential in establishing the female teen archetype, in the next few films: The Breakfast Club (1985) and Pretty in Pink (1986). 1984 The Razzies presented the 'Worst Actor' award to Christopher Atkins for his role in A Night in Heaven (1983), and 'Worst Actress' (and 'Worst Picture') awards to Pia Zadora for The Lonely Lady (1983). In 1990, Zadora's film also received a 'Worst Picture of the Decade' nomination and in 2005 the 'Worst 'Drama' of the First 25 Years' nomination. 1984 A raunchy comic derivative of Animal House (1978) was Revenge of the Nerds (1984) that told about a group of outcast, misfit and bullied nerds in the Adams College chapter of Lamba Lamda Lamda (Tri-Lams), who feuded with the Alpha Beta jocks during a major tournament called the Greek Games. Surprisingly, it was the 16th highest-grossing (domestic) film of 1984, at $40.9 million. Its popularity led to three sequels (the last two were made-for-TV movies): Revenge of the Nerds II: Nerds in Paradise (1987), Revenge of the Nerds III: The Next Generation (1992), and Revenge of the Nerds IV: Nerds in Love (1994). An unsuccessful TV pilot was also released in 1991 based almost entirely on the movie. 1984 Actor Rob Reiner made his directorial debut with This Is Spinal Tap (1984) - it set the standard for a mockumentary (or "rockumentary") in its depiction of a fictional heavy-metal rock band named Spinal Tap on tour in the US during the fall of 1982. It has been rated one of the best cult movies and comedy films of all-time. Its most memorable scene was the one in which a band member described how the amplifier had an "11" on its dial: "These go to eleven." Actors Michael McKean, Harry Shearer, and Christopher Guest (all former Saturday Night Live cast members, appearing as David St. Hubbins, Derek Smalls, and Nigel Tufnel) subsequently released three official albums as Spinal Tap, and appeared on several shows in character, including The Simpsons. 1984 Nick Castle's space-opera The Last Starfighter (1984) was about a trailer-park dwelling teenage boy (Lance Guest) with video-game prowess getting involved in an interstellar war between the Rylan Star League and wicked Ko-Dan forces. It was a groundbreaking film - the first film to feature the extensive use of CGI -- most importantly, the integrated use of photo-realistic, computer-generated (CGI) models for all Gunstar vehicles or spaceships, or planet shots, rather than more traditional miniature models (as in 2001: A Space Odyssey (1968) or Star Wars (1977)). The technique was called digital scene simulation or 'integrated CGI' - the special effects were actually representing real-world objects, and the CG was fully integrated with the live-action. Although the film never had a sequel, there were several other offshoots: non-filmic adaptations of the storyline (including a novelization and comic book series), an off-Broadway musical, and videogames (arcade and home computer versions, both with and without the Last Starfighter title). 1984 The world's first commercial 4-D film was The Sensorium (1984), first seen in Baltimore, MD's Six Flags Theme Park, where multi-track sound, bodysonic seats and Scent-a-Vision enhanced the experience. 1984 French film-maker Francois Truffaut died at the age of 52 of a brain tumor. He was famed as one of the founders of the French New Wave movement, as well as being a director, actor, and screenwriter. His most notable films as director were The 400 Blows (1959), Shoot the Piano Player (1960), Jules and Jim (1962), Fahrenheit 451 (1966), Day for Night (1973) - Academy Award winner of the Best Foreign Language Film Oscar, and The Story of Adele H. (1975). 1984 The Godzilla franchise film, The Return of Godzilla (1984), (aka Godzilla 1985, or Gojira) was a reboot and direct sequel to the original film Godzilla (1954) (aka Gojira). It returned to the original horror elements without schlocky, goofy, or campy scenes. 1984 Director Sam Peckinpah died at the age of 59 in Inglewood, CA. His most notable contributions to cinema were the revisionistic Western The Wild Bunch (1969) and Straw Dogs (1971) - both controversial for their violence (he was nicknamed "Bloody Sam"), and two others: the western Pat Garrett and Billy the Kid (1973) and the cult film Bring Me the Head of Alfredo Garcia (1974).